When I find animal paintings, I just can't resist them and especially if they are babies. I've had this little sheep painting for quite a while, but just packed away. Time to bring it out and enjoy. I also have to show you a fabulous gift I received from Michelle @ The Nest at Finchrest. See the two pair of rooster salt and pepper. She knew I would totally adore these, so she generously sent them to me. Don't you absolutely love them. I kept thinking I would do a tablescape and show them off, but that didn't happen, so I don't want my bad manners to go on any longer. Thanks tons Michelle, you know that I adore them. Now back to this corner that I change constantly. 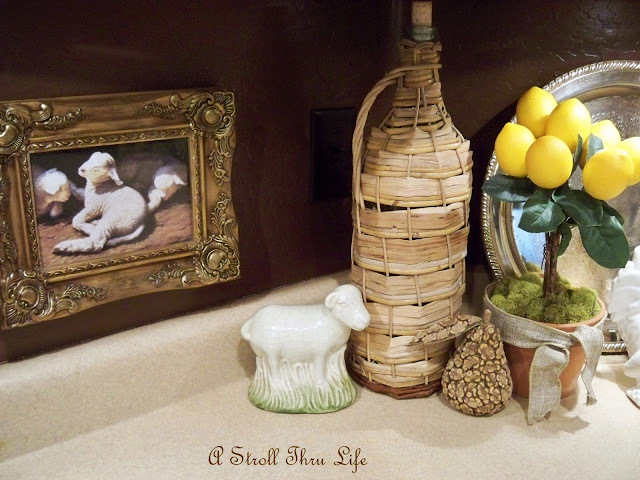 I've had a rooster painting hanging on the wall in this spot forever, so I thought the little sheep would brighten up the corner and give me something new to look at. My little cow figurine looks great with it too, in fact it almost looks like a sheep. 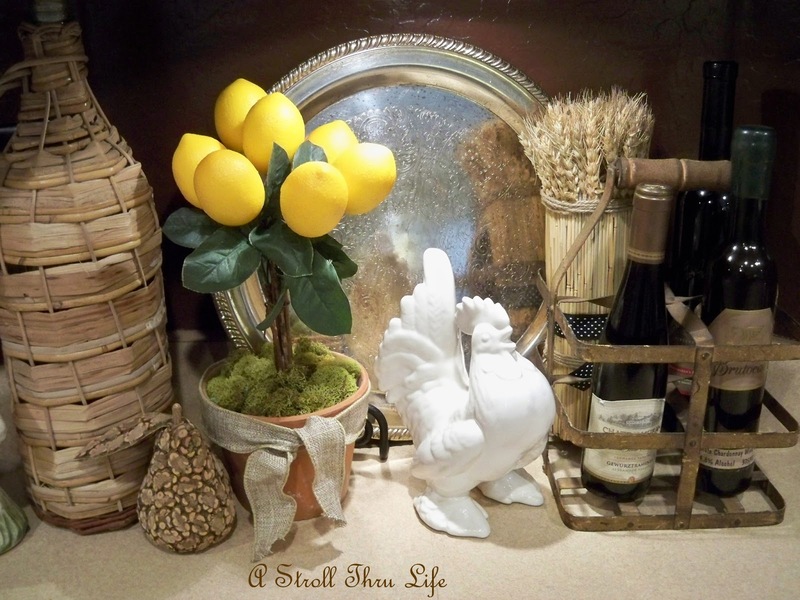 I also added a rooster and I am totally enjoying my lemon topiary. I need to make a few more topiaries, they are so fun. My favorite corner to play with and change things up. I think the sheep are a great addition. See you this evening for Inspire Me linky party. Be sure to link up anything and everything, we want to see it all. What a sweet little sheep, Marty! In addition to finding great frames, you have a knack for finding these great little animal prints, too. I still love the bunny ones I found after seeing yours. I love the sheep painting! Your little corner always looks nice! You just made my day, Marty - I see the old roosters have made their home with you quite well. They look perfect with that vingnette! I truly enjoy seeing your changes! It never fails to inspire making changes of my own here at the nest, too! I ♥ your little lamb painting, and you will have to be sure and use that next Easter - sweet lambs work so perfectly that time of the year, too! Have a fabulous week, and thanks again for mentioning me. You didn't have to, but this was the first post I read today and what a fun one to read! Beautiful painting Marty! Nice vignette! Great corner vignette! Such a pretty little painting. I love your sheep and your vignette. So pretty. I know how you feel *smile*. I can't resist them either. Simply a beautiful artwork with the sheep, Marty! Lovely vignette, as always. Have a great week. Your little feathered friends from Michelle are so cute, Marty. I adore the picture of the little lambs. It is so sweet! The lemon topiary is wonderful and you truly did a great job with making it! Thanks for bringing us into this pretty corner to check out what you had done with it! Your kitchen corner is always has so many interesting and pretty things. 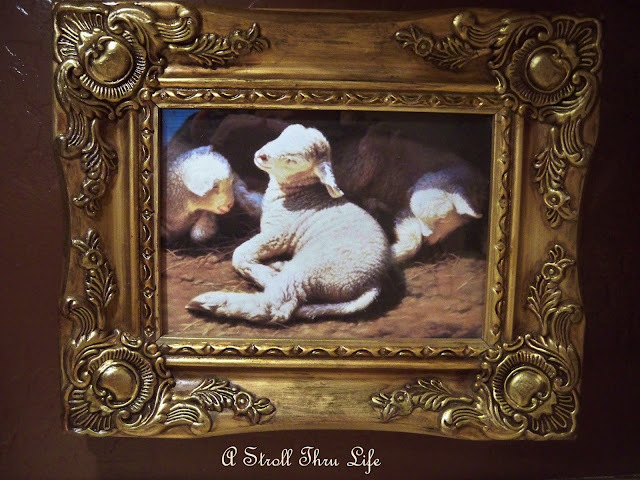 LOVE the little lamb painting. So sweet.Thanks so much for hosting. 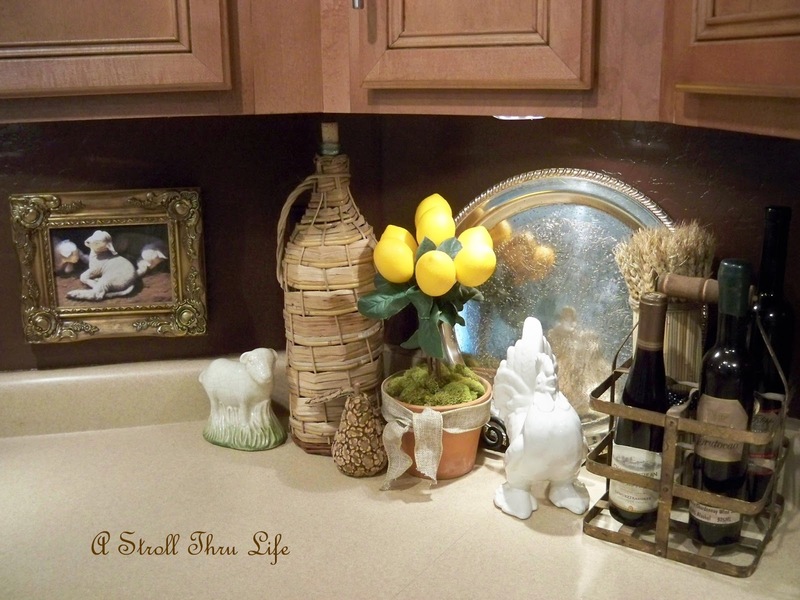 Beautiful kitchen vignette, Marty! Love the painting! Marty, I love the little lamb picture so pretty. 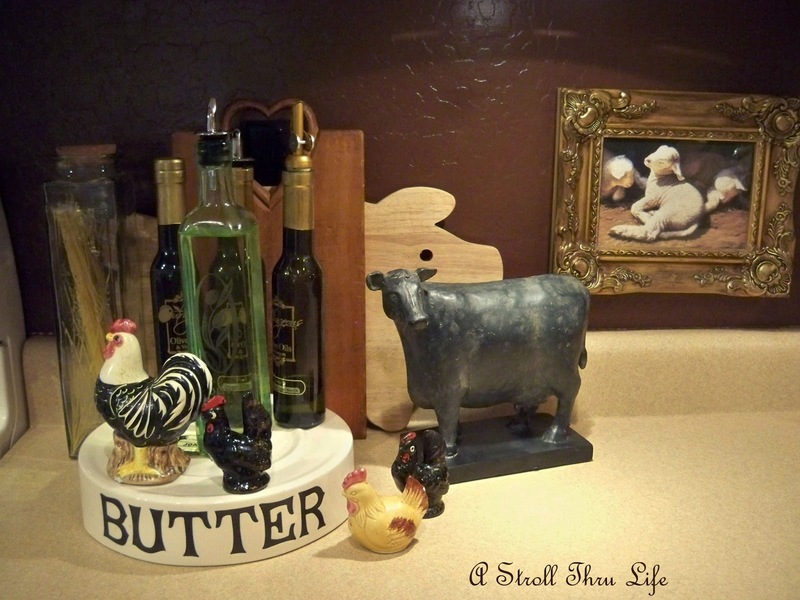 Your corner looks great and the rooster salt and pepper shakers. 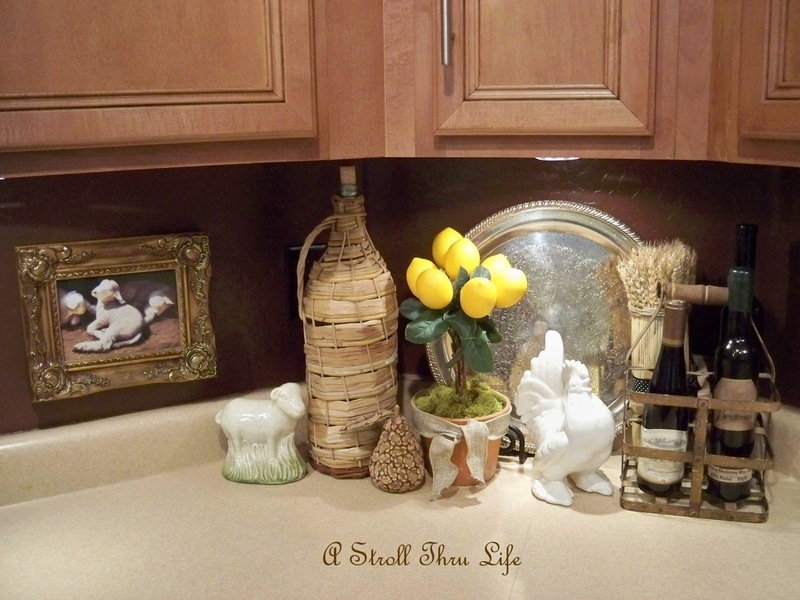 I love those little corners in the kitchen, don't you! and you decorate yours so beautifully! Your sheep painting is charming, dear friend!!! Love the vignette with the sheep figurine beside the painting! Your lop~eared bunnies are still my favorites!! !